Tony Barnett has been summonsed to appear in Court On Monday July 9 2012. "THE CHARGES BROUGHT AGAINST ME ARE THAT OF A CRIMINAL NATURE, BECAUSE I FEEL THAT THERE IS A RELATORY ACTION AGAINST MY ACCUSSERS, I WISH TO APPEAL TO THIS HONOURABLE COURT TO MAKE AN ORDER FOR FULL DISCLOSURE AND TO HAVE WITNESS SUMMONSES ISSUED. " I AGAIN FIND MYSELF HAVING TO PROVE MY INNOCENCE TO ALL AND ANY CHARGE OF CRIMINAL DAMAGE, AND TRESPASS. THE CRIMINAL DAMAGE IS ALLEGED, THE GATES AND OTHER WORKS WERE LIFTED OUT OF THE GROUND AFTER BEING LOOSEND. 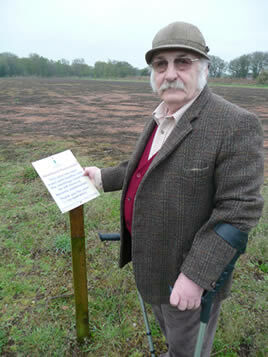 I SUBMIT THAT I REMOVED UNLAWFUL WORKS AND SIGNAGE FROM THE COMMON LAND. MAY I ALSO SAY THAT STEPHEN LEWIS TOOK PHOTOS OF THE GATES AND SIGNAGE AFTER MY COLLEAUES AND I HAD LEFT THE COMMON? IT IS THEREFORE DENIED THAT WHAT IS SHOWN IN THE PHOTOGRAPHS WAS CAUSED SUBJECT TO MY INSTRUCTIONS TO HAVE THE UNLAWFUL IMPEDIMENTS LIFTED OUT OF THE GROUND. NO MEMBER OF BUTTERFLY CONSERVATION, OR STPHEN LEWIS WAS PRESENT WHEN THE ITEMS WERE REMOVED. I UNDERSTAND THAT I HAVE BEEN CHARGE WITH BREACHING A RE-STRATINING ORDER NOT TO ENTER ONTO PROPERTY OWNED BY BUTTERFLY CONSERVATION. I HAVE NOT ENTERED ONTO ANY LAND, OWNED OR LEGALLY OCCUPIED BY THE CHARITY, I THEREFORE PLEADED NOT GUILTY, AND TO MY HONEST BELIEF AND KNOWLEDGE MY PLEA OF NOT GUILTY WAS THE CORRECT PLEA. FROM THE EARLY DAYS OF MY INVOLVEMENT WITH WHITCHURCH HEATH COMMON CL21, I HAVE ENGAGED MYSELF IN REMOVING ALL UNLAWFUL IMPEDIMENTS AND OTHER WORKS FROM THIS COMMON CL21. 2 IN 2001, I WAS ARRESTED FOR ALLEGED CRIMINAL DAMAGE AND ASSAULT. I ELECTED TO BE TRIED AT THE CROWN COURT SHREWSBURY ON THOSE CHARGES. WHILST AWAITING MY HEARING I WAS ARRESTED MANY TIMES ON VEXATIOUS CLAIMS, SO IT WAS THOUGHT BEST BY THE MAGISTRATES WHILST AWAITING MY HEARING I SHOULD NOT VISIT THE COMMON. THE CLAIMANT HAD REQUESTED THAT I CIRCUMVENT THE ENTIRE COMMON SHOULD I WISH TO VISIT THE TOWN OF WHITCHURCH, AND TAKE A LONG WAY ROUND TO VIST GREEN LANE FARM, THE PROPERTY OF A CLOSE FRIEND. THIS THE MAGISTRATES REFUSED, BUT I PROMISED TO ACCESS MY FRIENDS HOME FROM A DIFFERENT ROUTE, A PROMISE I COMPLIED WITH FULLY. I APPEARD AT THE CROWN COURT SHREWSBURY IN DECEMBER 2001 TO ANSWER THE CHARGES AGAINST ME. HIS HONOUR THE JUDGE MADE THE ORDER TO THE CLAIMANT TO WITHDRAW THEIR ALLEGATIONS AND CLAIMS, AND GAVE A FURTHER DAY TO DO THIS. ON THE FOLLOWING DAY BECAUSE THE CLAIMANTS WOULD NOT, HIS HONOUR SCRATCHED OUT THE CLAIMS MADE AGAINST ME, MY DEFENCE STATEMENTS HAD BEEN ACCEPTED! HE VERBALLY CRITISIZED THE CPS AND THE CLAIMANTS LEGAL TEAM FOR THE ILL PREPARATION, NO PROOF OF RIGHTS FOR PREES HEATH LTD TO MAKE THE DEED OF EASEMENT WAS DISCLOSED. TO SAVE A LONG ADDRESS TO THIS HONOURABLE COURT, I INTEND TO SUBMITT A COPY OF A BOOK I HAVE WRITTEN WHICH WILL GIVE A MORE INDEPTH EXPLANATION. THE SITUATION REGARDING OWNERSHIP CLAIMS TO WHITCHURCH HEATH COMMON CL21, REMAINS THE SAME, IT IS STILL SOMETIMES ADDRESSED AS PREES HEATH, WHICH ON THE SURFACE SEEMS INNOCENT ENOUGH, UNTIL ONE BREAKS THE SURFACE. MY BOOK WILL GIVE IN DETAIL HOW THE INNOCENT CALLING HAS TURNED INTO A CRIMINAL ONE. TODAY, NO PRE-REGISTRATION OF TITLES OR THAT OF A STATUTORY DECLARATION CAN BE SHOWN TO VALIDATE THE CLAIMS MADE BY STEPHEN LEWIS, MARTIN WARREN AND JOHN DAVIS, OR THAT OF THE OWNER OF THE FIRM PREES HEATH LTD, GRAHAME, JAMES FITZHARDINGE BERKELEY. IN 2001, THE CROWN COURT ORDERED DICSCLOSURE, NONE WERE MADE, HAD AN ATTEMPT BEEN MADE BY THE CLAIMANTS I WOULD NOT BE IN THE EVIL CLUTCHES OF THOSE THAT TO DAY HAVE ME BEFORE THIS HONOURABLE TO DEFEND MY CHARACTER. DUE TO WHAT IS EVIDENT TO ME OF TOTAL BIAS BY COURTS IN SHROPSHIRE, TOTAL DISREGARD TO MY INSTRUCTIONS BY SOLICITORS, I AM IN THE POSITION OF HAVING TO DEFEND MYSELF BEFORE WHATEVER COURT I AM TO APPEAR IN. THE CHARGES BROUGHT AGAINST ME ARE THAT OF A CRIMINAL NATURE, BECAUSE I FEEL THAT THERE IS A RELATORY ACTION AGAINST MY ACCUSSERS, I WISH TO APPEAL TO THIS HONOURABLE COURT TO MAKE AN ORDER FOR FULL DISCLOSURE AND TO HAVE WITNESS SUMMONSES ISSUED. I ALSO WISH FOR THE MATTERS TO REMAIN AS CRIMINAL CHARGES, SO THAT I MAY QUESTION MY ACCUSSERS RELATING TO THEIR CRIMINAL ACTIVITIES AND VEXATIOUS CLAIMS AGAINST ME. AN ORDER BY HH JUDGE MORGAN, IN 2011 WAS THAT I PREPARE A FILE OF MITIGATION, AND TO APPLY FOR AN ORDER FOR DISCLOSURE AND FOR SUMMONSES. I COMPLIED WITH THAT ORDER, BUT JUDGE MORGAN REFUSED MY APPLICATIONS, AND PREVENTED ME FROM EXAMIMING STEPHEN LEWIS, AND DID NOT REFER TO THE FILE THAT HE HAD ORDERED TO BE PREPARED. MY ENTIRE DEFENCE IS RELIANT ON THE CLAIMANTS BEING ORDERED TO DISCLOSE DOCUMENTATION THEY CLAIM TO HOLD, AND FOR THOSE CLAIMANTS TO BE EXAMINED IN COURT. I FEEL CONFIDANT THAT I AM ABLE TO EXAMINE THE CLAIMANTS, DUE TO THE KNOWLEDGE I HAVE GAINED ON MATTERS RELATING TO WHITCHURCH HEATH COMMON CL21 aka prees heath common. I WISH TO BE PERMITTED TO RE-PRESENT THE SAME FILE OF MITTIGATION TO THIS HONOURABLE COURT; THAT WAS ORDERED BY HH JUDGE MORGAN TO BE COMPLETED. I THEREFORE WISH TO BE ALLOWED TO DEFEND MYSELF AGAINST THE CRIMINAL CHARGES, IN THE ABSENSE OF A PROFFESSIONAL SOLICITOR IN THESE MATTERS. I INTEND TO SUBMIT TO THIS HONOURABLE COURT THAT THE CHARGES OF CRIMINAL DAMAGE TO PROPERTY OWNED BY BUTTERFLY CONSERVATION, BE DISMISSED, TO ASK THIS HONOURABLE COURT TO HAVE ALL MONIES PAID FOR THE ALLEGED DAMAGE TO BE RETURNED. THE HUMAN RIGHTS ACT, ARTICLE 6. THIS ACT PROVIDES THAT I HAVE THE RIGHT TO A FAIR AND PUBLIC HEARING, THIS APPLIES TO BOTH CRIMINAL CHARGES AGAINST ME, AND CIVIL RIGHTS AND OBLIGATIONS. THE CHARGES AGAINST ME ARE CRIMINAL AND ACCORDING TO LAW I HAVE CERTAIN GUARANTEED RIGHTS TO DEFEND MYSELF, I WISH TO AVAIL MYSELF OF THOSE RIGHTS. I CONFIRM THAT I AM NOT IN A FINACIAL POSITION TO AFFORD LEGAL REPRESENATION.